Note: This is an “Old School” Coach Glassman favorite. Go heavy on the Barbell Back Squat today and try to set a personal record. The gym goal is for all our Athletes to have a bodyweight Back Squat. The EPIC Fitness Van will ride today, so come mentally prepared to tackle this workout on the soft sand! 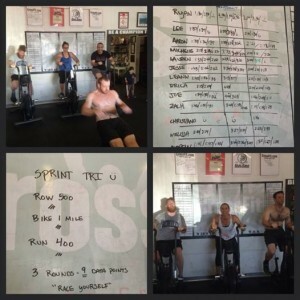 The CrossFit Amundson Sprint Triathlon day was awesome! Over half of the Athletes at our gym were able to average a 1:30 split on the 400 meter run, for all three rounds! And our very own Lee Bowden did the entire workout twice!